We were recently asked, “what is the difference between MIOTY and Open Platform Communications Unified Architecture (OPC UA)?”. This question reminded us of the plethora of IIoT protocols for networking and how confusing it can be to distinguish one from the other. To help orient yourself within the jungle of networking technologies, this week we will provide a bird’s eye view of the IIoT protocol stack and the various Information Technologies (IT) and Operational Technologies (OT) mapped to it. In an IoT application, multiple tasks need to be performed to deliver a message from an end device to the cloud. That’s why we need, not a single, but a stack of different protocols, each of which is responsible for a set of tasks. To better explain this, let’s look at the following analogy. Let’s say I want to send a package between two cities in Germany using a courier. The package must first be labeled with the sender’s and receiver’s addresses. Based on these addresses, the courier then decides the best route and means of transportation for the shipment. Sometimes, the package needs to pass through several facilities for routing. For a seamless process, deliveries must be done in the right order, packages must remain intact and errors like false addresses must be reported in a timely fashion. At the end, the package is received, unpacked and the receiver is happy with the content inside. The process of sending a message is quite similar. There are various tasks involved including transporting, addressing, routing, error reporting, integrity and reliability management. And just like different groups of postal workers are in charge of specific shipping activities, different protocols are responsible for handling a specific set of networking tasks. The Open Systems Interconnection (OSI) and Transmission Control Protocol/Internet Protocol (TCP/IP) networking models are the most common frameworks used to represent networking tasks using multiple layers. Widely adopted IoT protocols can be mapped to these two models as outlined in the below table. For an IoT network to function effectively, protocols at different layers must be interoperable with each other. In industrial IoT, the protocol landscape can be confusing with a vast assortment of available OT and IT. While OT protocols have been the backbone of industrial controls and automation, industry has adopted IT protocols have been newly adopted to enable cloud-based connectivity and IIoT applications. Note that IT and OT protocols do not always work with each other and the IoT protocol stack may not always be applied to OT architecture. 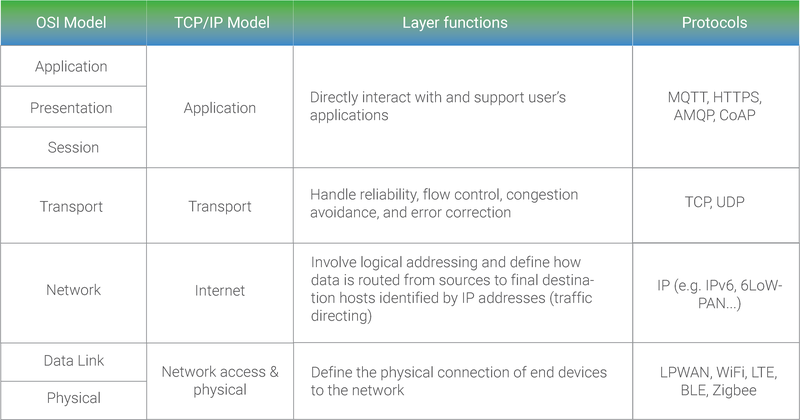 Typically, network and transport layers are often skipped either because older OT ethernet protocols do not support TCP/IP suite or because time-sensitive, millisecond low-latency data exchange is strictly required. Furthermore, in IT systems, application layer protocols like MQTT and AMQP are used for message queuing and delivery of payload to the cloud for analytics and visualization. In OT systems, application layer protocols such as OPC UA or CIP are used to transfer data from field devices like PLCs to high-level plant control applications like SCADA or MES. To close the OT/IT gap and enable data exchange from automation systems to the Internet, major industry efforts have been made to promote interoperability between IT and OT protocols. For example, today OPC UA can be paired with MQTT or AMQP to enable data exchange from OPC-UA servers / field devices to the cloud, either directly or via an IoT gateway. Likewise, many modern Industrial Ethernet protocols are now compatible with higher-layer IT protocols. So, what is the difference between MIOTY and OPC UA? MIOTY and OPC UA are intended for totally different networking purposes. MIOTY is a network access and physical layer IT protocol, enabling last-mile sensor communication in non-time sensitive IIoT applications. On the other hand, OPC UA is an application layer OT protocol used for tying PLC data to industrial automation solutions like SCADA and MES systems. Bridging the OT/IT gap introduces a combination of several physical layer and application layer protocols in a single architecture and latency, bandwidth, range, power usage, and security are pivotal factors to consider in selecting the right set of interoperable IIoT protocols for your network.